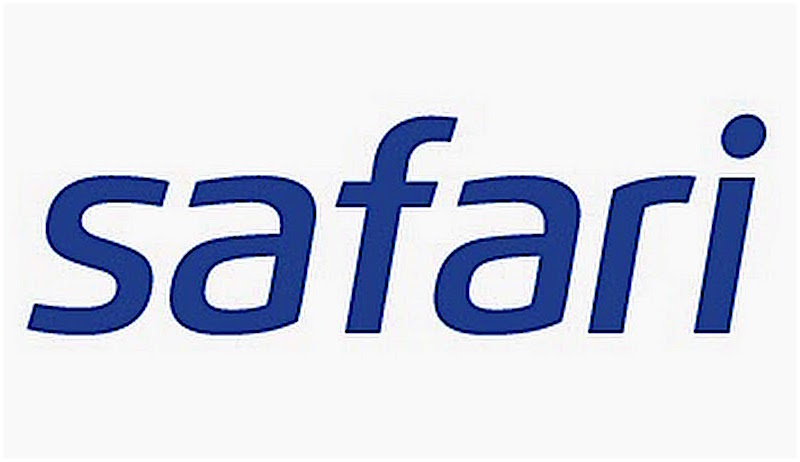 Your private tour is done at a comfortable pace, you are not bothered by obnoxious strangers this is your safari. 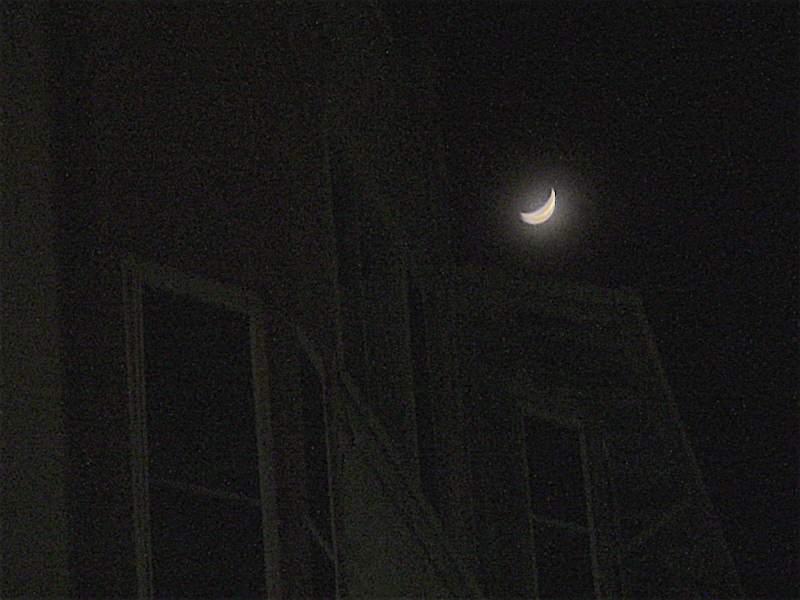 Questions are encouraged, if you are on a ghost tour, bring your ghostometers. 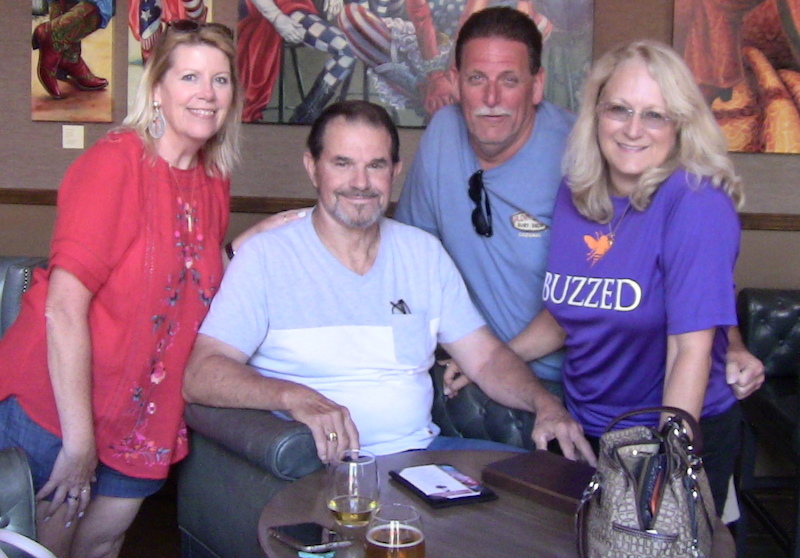 ABOVE & BELOW: Some happy people who took Allan's tours --- these two photos were taken years apart -- in the Plaza.. 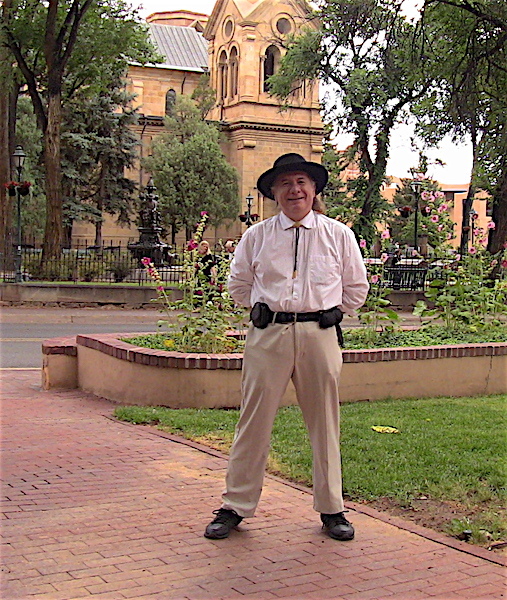 Sometimes Allan's tours end in the historic square --- other times we box the plaza and move on, Allan's different tours, have diverse routes --- schedule a safari 505-986-5002 or 505-231-1336.. 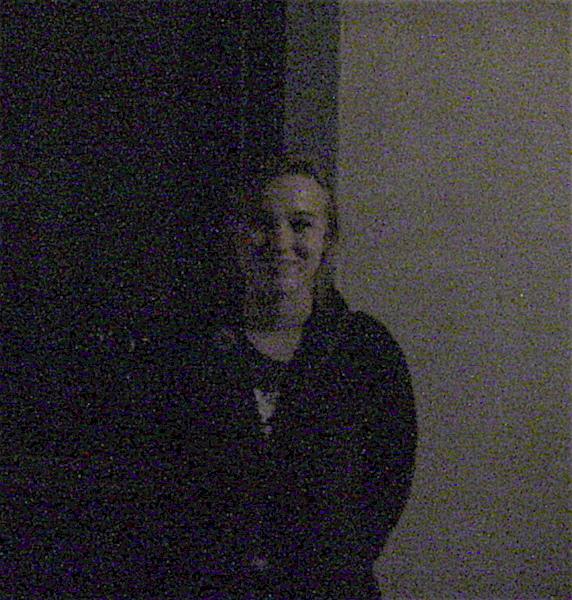 Remember on your private paranormal tour --- if you have a ghostometer, bring it. 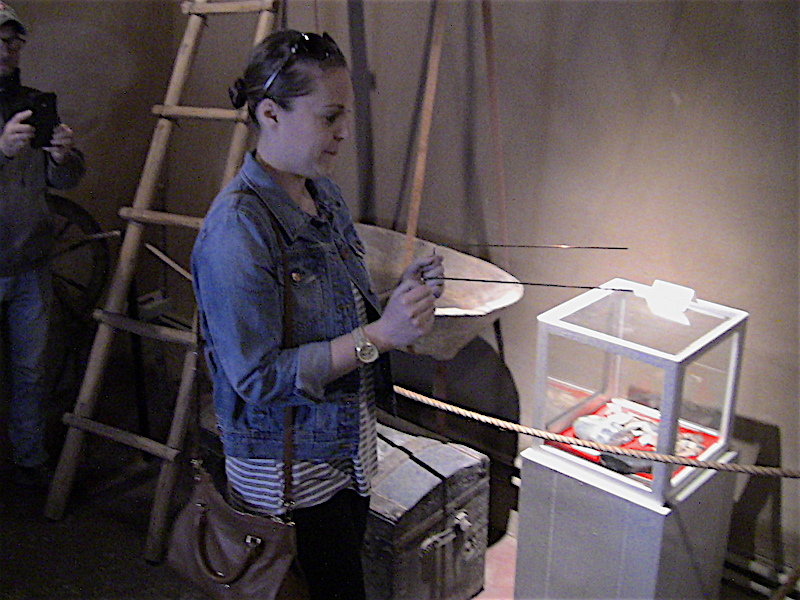 BELOW: Inside the haunted OLDEST HOUSE -- dowsing rods. 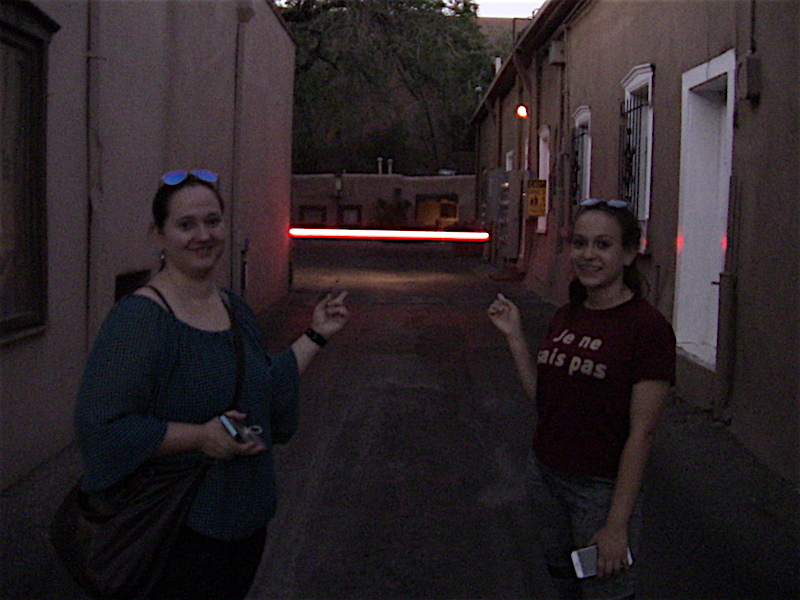 Below: Only in Santa Fe would one find a Light Saber-esque gadget -- "GIVE UP LUKE, JOIN THE DARK SIDE OF THE FORCE." This location is next to 109 East Palace Avenue, (which is where MANHATTAN PROJECT WWII - atomic bomb mayhem occured). 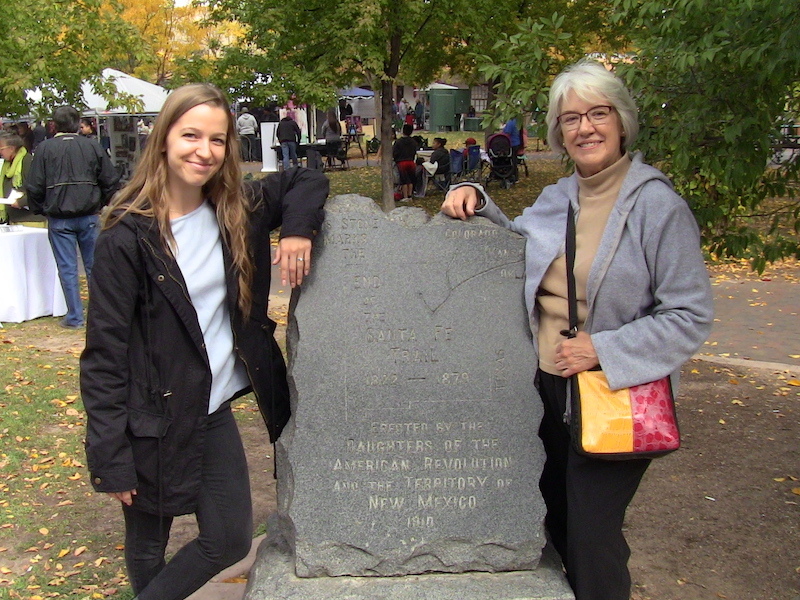 On your history tour you hear the true story of the Manhattan Project in Santa Fe. 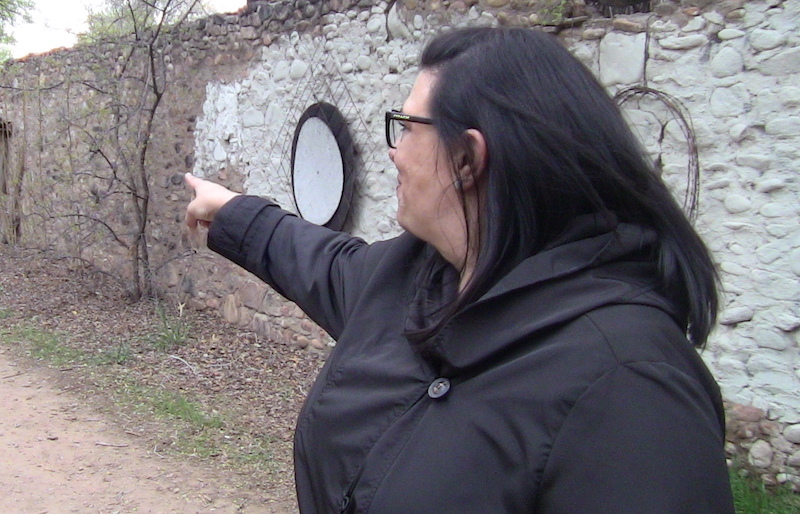 You see the actual places + get the TRUTH on soviet spies in SANTA FE during World War II, this is not a mainstream propaganda tour. 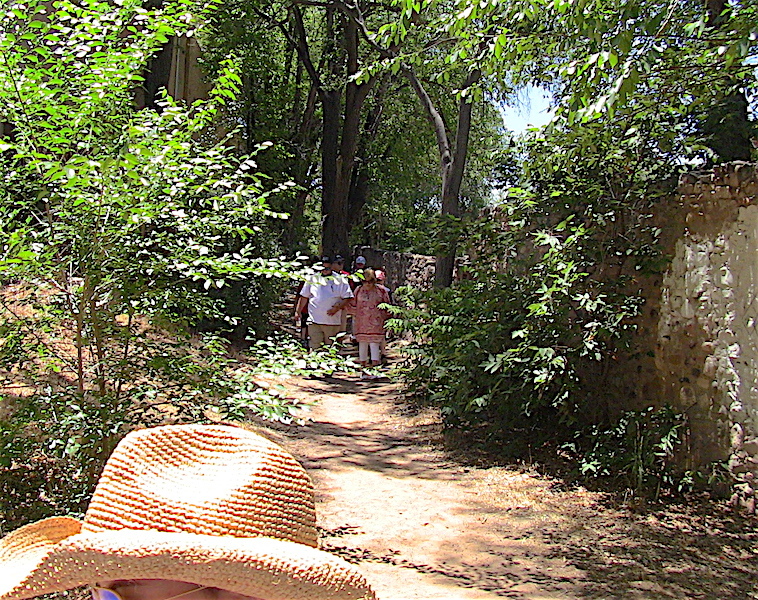 ABOVE & BELOW: Allan guides night and day tours, history or ghost... Also Allan does his best to aim the tour towards your interests... On your tour -- we explore and go down lanes and trails rarely ventured --- THE RUINS OF MATACUMBE -- (WINK-WINK). Day or night tour -- if you have a ghostometer or ap, bring it! Below, another tour; something unseen followed this lady! The above wall area -- mainly the other side, has been a focal point of hauntings. 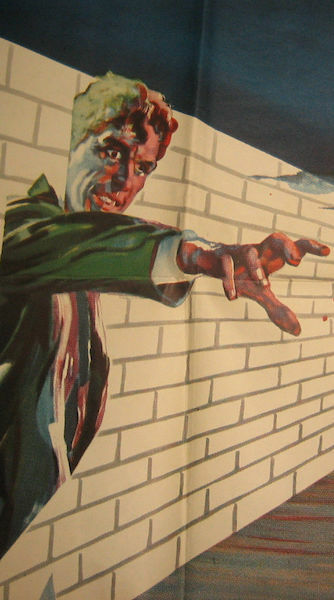 People have seen ghostly figures, and believe it or not through the centuries have been pushed and have been choked or have been overcome with panic attacks. When you tour with Allan you go to where the energies linger. 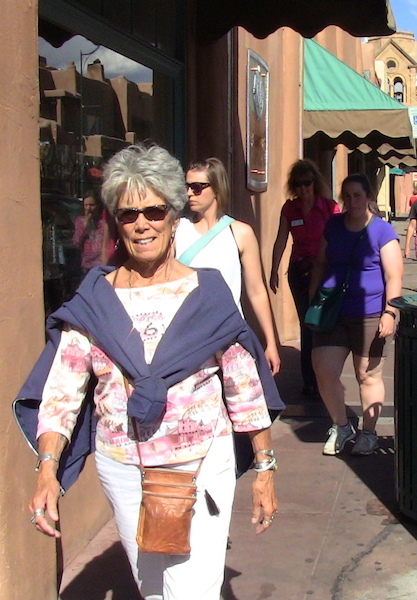 BELOW: A review of the Santa Fe Sherpa's tour. 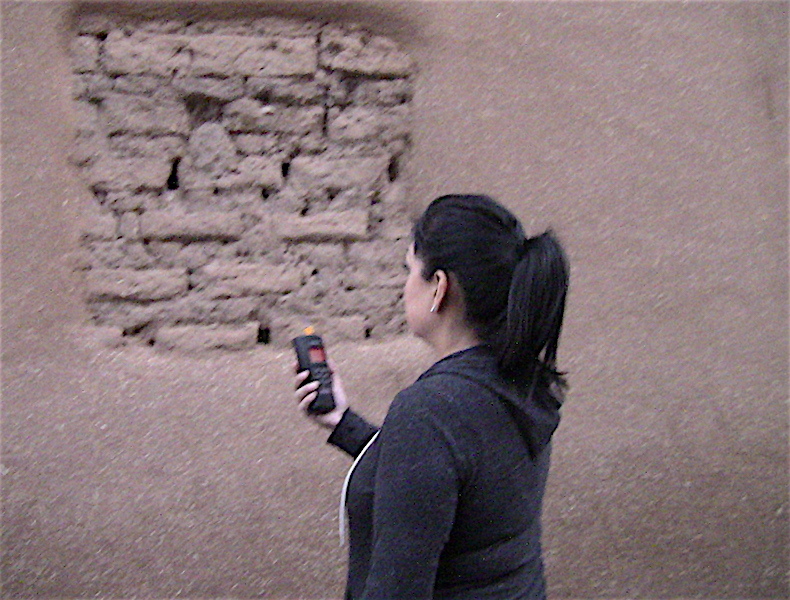 CLICK HERE -- HAUNTING SANTA FE --GHOSTS THAT CLING!!! 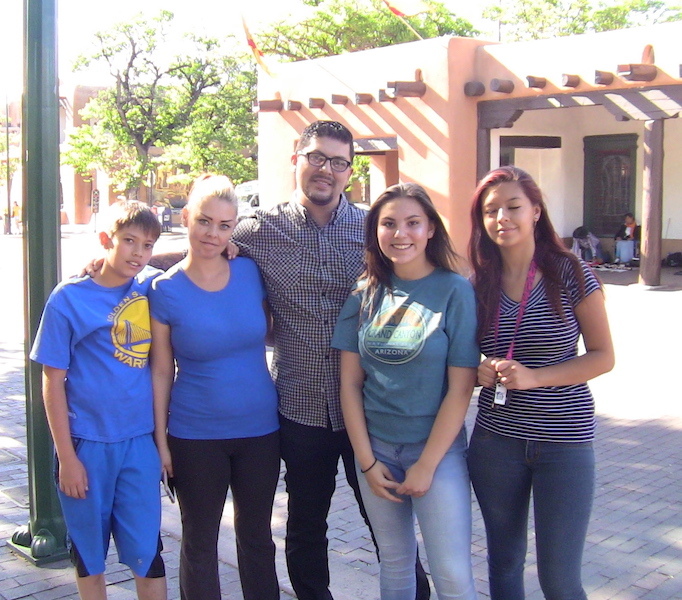 After reading reviews (SANTA FE TOURS), our group of 4 really wanted to take Allan's tour. I reached out to him one morning to enquire about a tour. 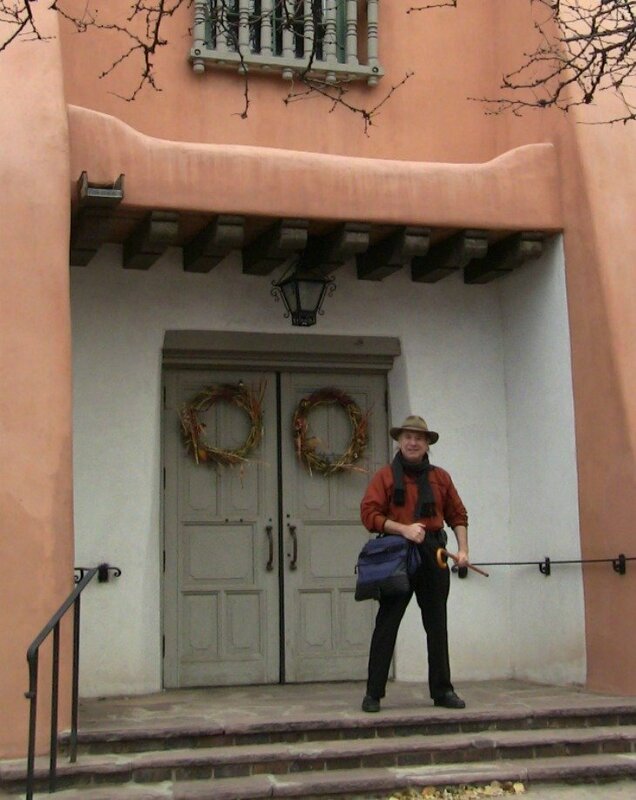 Below; inside the historic & haunted -- LA POSADA -- this exquisite building is a world class resort, during Wild West days it was the mansion of Abraham Staab, a ruthless man who ran the infamous SANTA FE RING. The man maybe right. Through the centuries the (FOREGROUND) room has been the focal point of some strange metaphysical goings on. 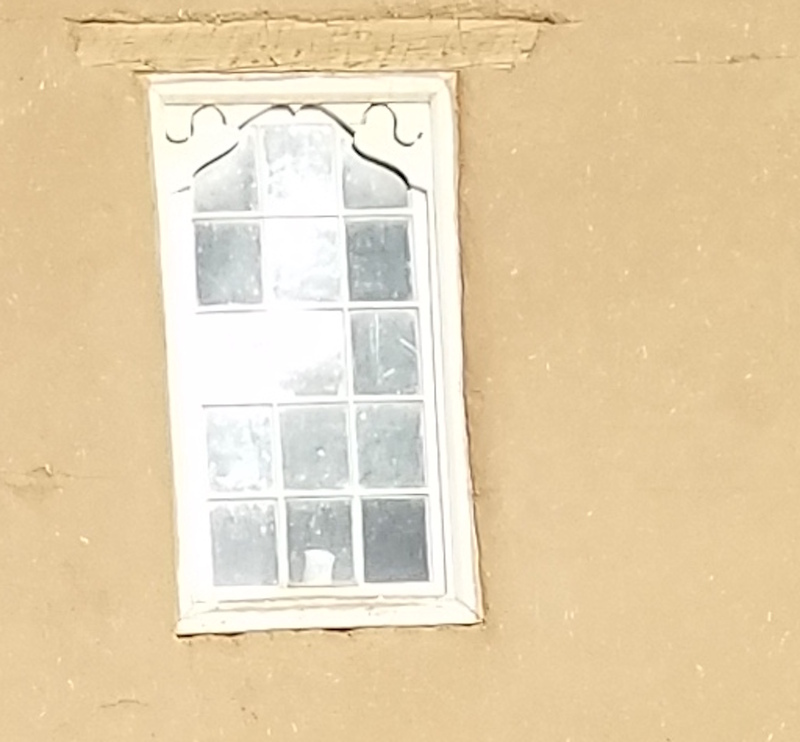 On a ghost tour --- Texas-Al---- who is a darn good shadow chaser thought there was paranormal movement in the above church window, nobody saw anything with the naked eye. 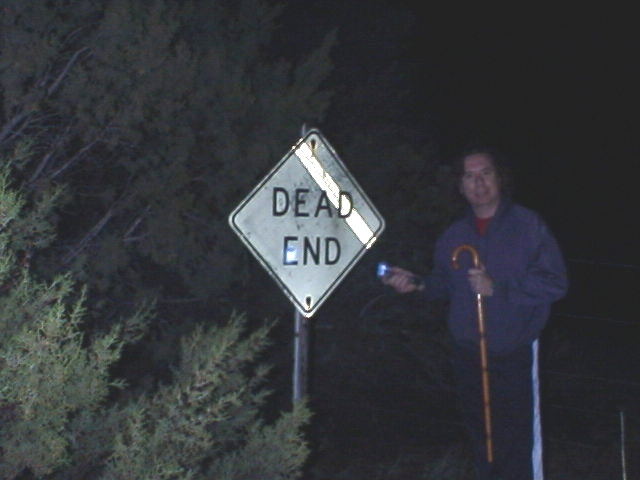 Texas-Al knew nothing of this location, and yes through the years metaphysical activity has been reported in the window and at the front entrance. 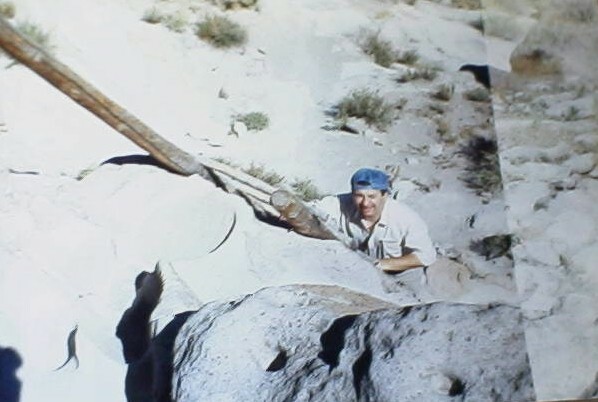 BELOW: ALLAN PACHECO who is not to be confused with TEXAS AL -- blew up the photo that was taken on the tour -- is something or somethings in the photo -- is it a trick of light + imagination and reflection or? 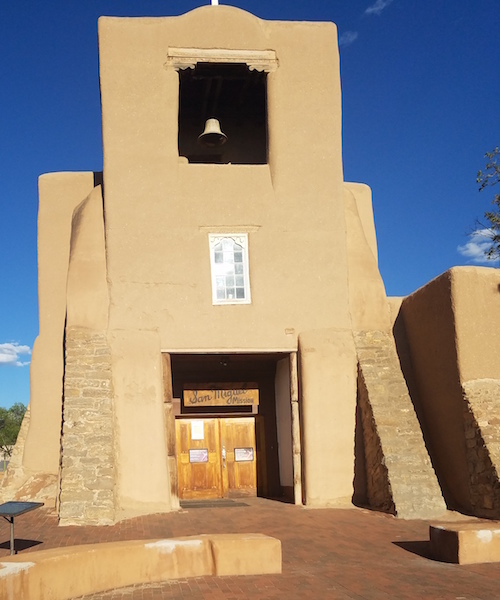 One thing is fact, this church is said to be haunted by a Franciscan Padre and the place is also known to be a vortex for metaphysical energies. SUBMITTED FOR YOUR CONSIDERATION. Judge for yourself. YEAH or NAY? 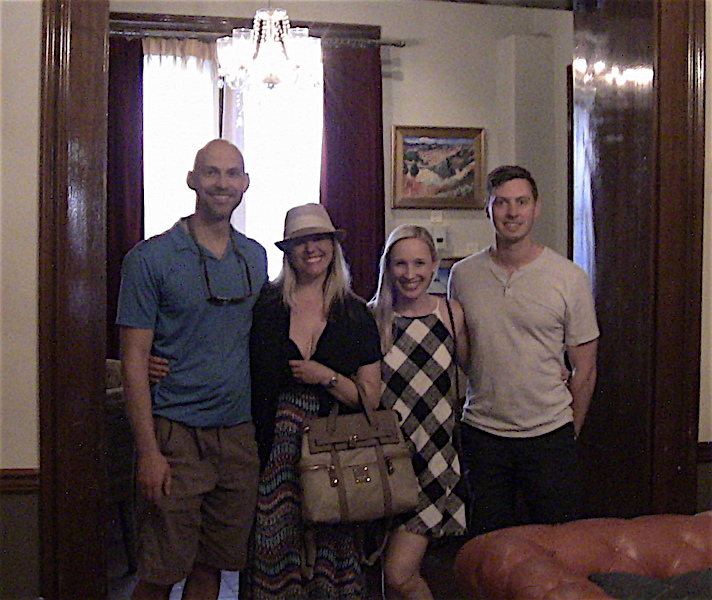 This group ended the ghost tour at the historic LA POSADA -- which was the STAAB mansion during WILD WEST DAYS. This resort has a wonderful bar and staterooms. Its a great place to end a tour at. The Sherpa between ABQ-SF on a paranormal day-time investigation interrupts in the far distance a cartel drug deal -- the bad guys saw the Sherpa and fellow armed shadow chasers and cut out. 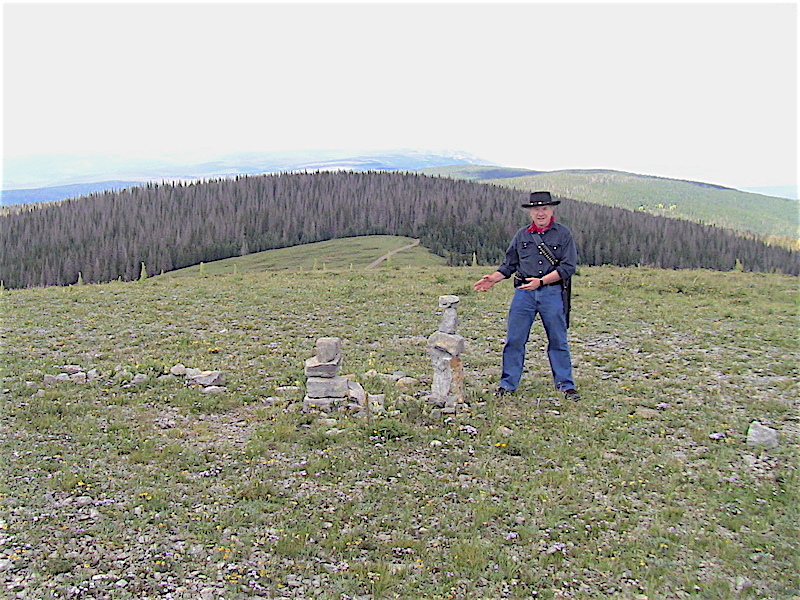 Santa Fe or New Mexico in some aspects is still the WILD WEST. With the Sherpa you are in good hands.